The small town of Bhimtal is famous as a lake resort. It offers to the tourists a quiet vacation and facilities for water sports. This beautiful town also attracts hundreds of tourists every year by its peaceful green surroundings. Bhimtal is located in the northern part of the state of Uttar Pradesh, in the northern region of India. It is located at an altitude of 1,371 m above sea level amongst the Kumaon hills. It is 23 km from Nainital. The weather in Bhimtal is alpine. Summers (April-June) are mild and winters are cold (November-February). It experiences southwestern monsoon rains in July-September. The best time to visit Bhimtal is from mid-April to mid-July and from mid-September to October. The origin of this small town is obscure. Bhimtal got its name from Bhim, one of the legendary personalities and central characters mentioned in the Indian epic of Mahabharata. The main tourist attraction of this small hill station is its lake. It is one of the largest lakes in the district of Nainital. The lake offers scope for boating to the travelers. In the middle of the lake, there is a beautiful island with a restaurant. The island provides a panoramic view of the lake as well as its luxuriant surroundings. Travelers can also explore the region around the lake and take a walk through the quiet forest surrounding the lake. There is a large Victorian dam at one end of the lake and terraced flower gardens can be found on either side. Bhimtal is also known for its lovely dappled paths, ravines festooned with dog rose and wild raspberry. Farmhouses are set among terraced fields and citrus trees laden with fruits. There is a Folk Culture Museum in Bhimtal, which is a private institution. 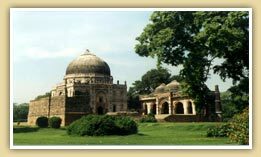 It has a good collection of artifacts and information about the hill districts of Uttar Pradesh. The collection includes ancient wooden artifacts, information about traditional rites, rituals, stone implements, and items of archeological importance. It also houses a sizable collection of reproductions and photographs of rock art. Naukuchiatal is 4 km from Bhimtal. It is a lake having nine corners. Like Bhimtal, Naukuchiatal also has quiet verdant environs, which attracts the traveler to it. This tree-fringed lake is good for boating. Sat Tal (literally seven lakes) is 7 km from Bhimtal. It is another important place to visit. Sat Tal was originally a cluster of seven lakes, out of which two have dried up. It is famous for fishing and boating. The densely wooded hills and little creeks along the shores of the lakes are a perennial attraction to the tourists. Godhakhel Temple is 3 km from Bhim Tal. BY AIR - Bhimtal does not have an airport of its own. The nearest airport is at Pant Nagar (55 km) and the nearest railway station is at Kathgodam (23 km). BY ROAD - Bhimtal is well connected by bus with Nainital and Kathgodam. Tourists can also reach Bhimtal by hiring taxi from Nainital or Kathgodam. We offer excellent accommodation facilities in and around Bhimtal. 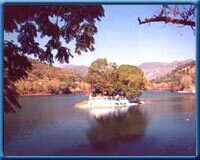 Tourism-of-India.com provides complete information on tourism in Bhimtal. Tourism-of-India.com offers package tours in order to make your visit to Bhimtal Pleasant.